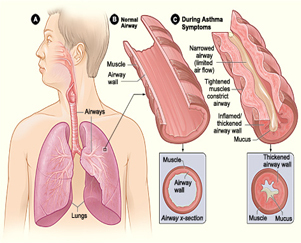 What are symptoms of Asthma ? 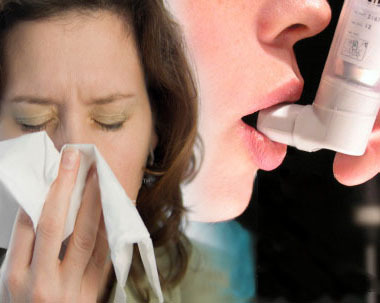 Most people with asthma have attacks separated by symptom-free periods. Some people have long-term shortness of breath with episodes of increased shortness of breath. Either wheezing or a cough may be the main symptom.Asthma attacks can last for minutes to days, and can become dangerous if the airflow is severely restricted. How does asthma affect breathing ? Asthma causes a narrowing of the breathing airways, which interferes with the normal movement of air in and out of the lungs. 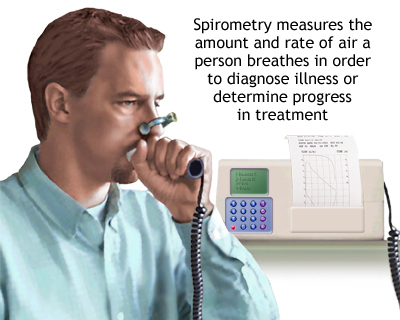 Asthma involves only the bronchial tubes and does not affect the air sacs or the lung tissue. The narrowing that occurs in asthma is caused by three major factors: inflammation, bronchospasm, and hyperreactivity.Inflammation increases the thickness of the wall of the bronchial tubes and thus results in a smaller passageway for air to flow through. The inflammation occurs in response to an allergen or irritant.The inflamed tissues produce an excess amount of "sticky" mucus into the tubes which clump together and form "plugs" that can clog the smaller airways.The muscles around the bronchial tubes tighten during an attack of asthma. This muscle constriction of the airways is called bronchospasm. The chronically inflamed and constricted airways become highly sensitive, or reactive, to triggers such as allergens, irritants, and infections. Exposure to these triggers may result in progressively more inflammation and narrowing. A doctor will diagnose asthma based on medical and family histories, a physical exam, and test results.Doctor also will figure out the severity of asthma—that is, whether it's intermittent, mild, moderate, or severe. The level of severity will determine what treatment you'll start on.The doctor will use a stethoscope to listen to the lungs. Asthma-related sounds may be heard. However, lung sounds are usually normal between asthma episodes. What pulmonologists do to cure Asthma? Asthma is a long-term disease that can't be cured. The goal of asthma treatment is to control the disease.A specific, customized plan for proactively monitoring and managing symptoms should be created. Someone who has asthma should understand the importance of reducing exposure to allergens, testing to assess the severity of symptoms, and the usage of medications. The treatment plan should be written down and adjusted according to changes in symptoms.Asthma is treated with two types of medicines: long-term control and quick-relief medicines. Long-term control medicines help reduce airway inflammation and prevent asthma symptoms. Quick-relief, or "rescue," medicines relieve asthma symptoms that may flare up.Your initial treatment will depend on the severity of your asthma. Followup asthma treatment will depend on how well your asthma action plan is controlling your symptoms and preventing asthma attacks. Asthma treatment for certain groups of people—such as children, pregnant women, or those for whom exercise brings on asthma symptoms—will need to be adjusted to meet their special needs.